The Dipylon inscription is a short text written on an ancient Greek pottery vessel dated to c.740 BC. It is famous for being the oldest (or one of the oldest) known samples of the use of the Greek alphabet. The text is scratched on a wine jug (oenochoe), which was found in 1871 and is named after the location where it was found, the ancient Dipylon Cemetery, near the Dipylon Gate on the area of the Kerameikos in Athens. The jug is attributed to the Late Geometrical Period (750-700 BC), and it has been dated to c.740 BC. It is now in the National Museum of Athens (inv. 192). The text is written in an archaic form of the Greek alphabet, with some letter shapes still resembling those of the original Phoenician alphabet. It is written from right to left, with the individual letters mirror-shaped in comparison with the modern forms. It is placed in a circle around the shoulder of the vessel. The text consists of 46 characters, of which the first 35 can easily be read as an hexametric verse in Greek. The fragmentary rest is believed to have been the beginning of the second verse of a distychon, but the exact interpretation is unclear. The text marks the vessel as a prize in a dancing competition. It is translated as: "whoever of the dancers now dances most lightly ...", and the second line is conjectured to have said something to the effect of "... he shall get me as his prize." 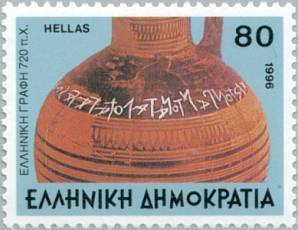 It is believed that either the Dipylon inscription or the so-called Nestor Cup is the oldest known alphabetic Greek inscription. The Nestor Cup, which also bears a verse inscription, was found in an excavation at the ancient Greek colony of Pithekoussai on the island of Ischia in Italy. It is thought to be of equal age with the Dipylon inscription or slightly younger. B. Powell (1988), "The Dipylon Oinochoe Inscription and the Spread of Literacy in 8th Century Athens". Kadmos 27: 65- 86. A. Kontogiannis (1999), "Η γραφή". In: M. Z. Kopidakis (ed. ), Ιστορία της ελληνικης γλώσσας. Athens, Elliniko Logotechniko kai Istoriko Archeio. 360-379.